There are alternative way that you can use Snapchat on Blackberry 10. We know that there is currently no official client snapchat application for Blackberry users. For a while you could use the following ways to install Snapchat on your BlackBerry device. 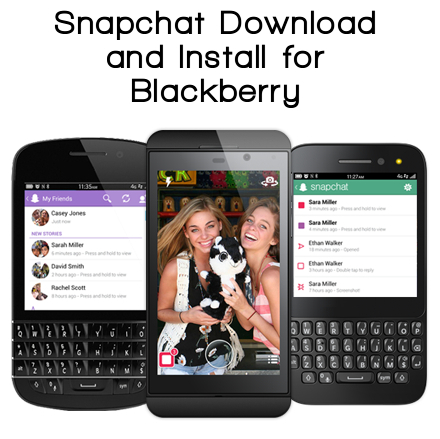 Snapchat Download and Install for Blackberry. The method that we are going to use is by sideloading the apps using Google Chrome. There are only two things you need to prepare. First of course you need Google Chrome Web Browser, you can get it here. The other thing is chrome extention called “PlayBook App Manager“, you can download and install it from Chrome Web Store. Once you install it, you will be redirected to the Playbook App Manager page. Do not close this page. Set your Blackberry on developmet mode by going to Settings >> Security and Privacy >> Development Mode. Then connect your blackberry to computer and you will see ip address. Input your ip address to the form and save. Click the ip address that shown there, you will see SSL certificate error, ignore it by clicking “Proceed anyway” and you will be redirected to login page, login with your blackberry device password. Now you will see App Manager console, this is where you install snapchat app, simply drag & drop the snapchat file you want to install on your device. Wait for the proceed, when it finish, there will be a message telling you that the installation is succeed. Now you can use Snapchat on Blackberry device, but there is a little problem with video, for some devices the videos are not working. Overall using Snapchat with this method are still good while we wait for the official app.